Nearly all the facts have come out about the 2018 Dodge Challenger SRT Demon from it’s immense horsepower rating, to its final production cost. theHere we have a video of the Demon V8 on the dyno showing exactly what the engine can do throughout its range. This video seems to have been posted on a few YouTube channels up to now with the same premise, showing you the engine speed up throughout its range, with rpm, Bhp and torque values along the way. The stats. being more impressive than the video itself. Everything about this engine is super impressive from its Supercharged 6.2-liter V8 which outputs 840 bhp at 6,300 rpm. airflow rate is 1,150 cubic feet per minute with the groundbreaking SRT Power Chiller™ which redirects the airflow from the air conditioning to the engine reduces the temperature by 18°F. The supercharger is a twin screw 2.7 liters per revolution, which is 1.1 inches longer bummer hellcats, dual water/air heat exchangers integrated into supercharger housing and electric pump flows up to 11.9 gallons per minute. The engine has completely reworked internals with forged alloy steel crankshaft, 90.9-millimeter stroke and revised balancing Induction-hardened crank bearing surfaces, Forged high-strength alloy pistons, 30-micron increased piston to bore clearance Powder forged connecting rods, high tensile fasteners Flow doubled on piston cooling oil jets, including Fuel injector pressure increased 27 percent Oil pan and windage tray optimized for high acceleration – tested up to 1.8 g.
To cope with all this power. The transmission has had its own tweaks which is a TorqueFlite 8HP90 eight-speed automatic with a torque converter, increasing the torque multiplication by 18% and stall speed increased 11 percent In Drag Mode. the transmission also minimises torque cut with gear changes by 400 millisecond. Outback there is a Limited-slip differential 230-millimeter ring gear, heat-treated aluminum differential housing, 3.09 final drive ratio for maximum acceleration, 20-percent thicker low alloy steel tube prop shaft, Upgraded halfshafts with 8-ball Cross-Glide inner and outer joints and larger diameter barshafts with 41-spline count. – The Demon V-8 ingests 173 cubic feet of air. That’s equivalent to the lung capacity of 816 humans. 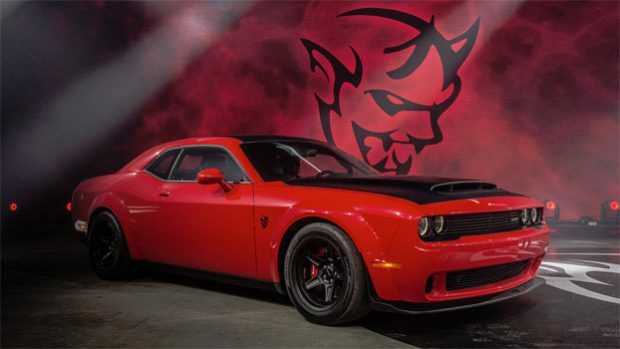 – 800 feet into a quarter-mile run, the Demon V-8 would empty all the air in the cabin of the Dodge Challenger SRT Demon. – 105 cubic feet Demon V-8 cooling system rejects 258 kW of heat at rated power – that would boil 1 quart of water at room temperature in 1.2 seconds. – The heat rejected is equal to 250 electric toasters. – High-octane fuel flows at 1.36 gallons per minute. – Typical shower head flows at 2 gallons per minute On each power stroke. – Piston and connecting rod are loaded with 11 tons of force – equivalent of 5 2018 Dodge Challenger SRT Demons. more than 50 times a second @ 6,300 rpm. – The driveline sees 11,164 lb.-ft. of ring gear torque at launch. Results in a 1.8 g launch. – More than 1 ton (2,500 pounds) transferred from front to rear wheels at launch. …and if you wanted a nice little comparison, here’s a 1971 Dodge Demon on the dyno. This obviously has had a ton of modifications such as the 671 blower, but still a fun watch and comparison. Next Story → Watch A Chevy Camaro Drive Up A Pole!